Cummins Inc. received Tier 4 Locomotive certification for its QSK95, making it the first single prime-power engine certified by the U.S. Environmental Protection Agency (EPA). At 4400 hp (3281 kW), the QSK95 achieves the highest output of any 16-cylinder high-speed diesel and is capable of a top speed of 125 mph (201 km/hr) as a prime mover, according to the company. 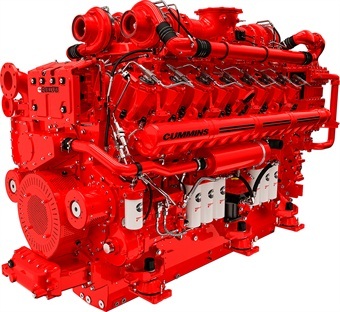 Combining Cummins' latest-generation Modular Common Rail Fuel System with quad-turbocharging, the QSK95 delivers reduced noise and excellent response in a smaller footprint than that of medium-speed diesels traditionally used in locomotives, according to the company. Integrated Selective Catalytic Reduction (SCR) aftertreatment makes the QSK95 capable of achieving the ultra-low- emissions required at Tier 4. The QSK95 powers Siemens® Charger locomotive — a diesel-electric passenger locomotive that will be put into service by the Departments of Transportation in Illinois, California, Washington state and Maryland, as well as Brightline™, the privately owned and operated passenger rail service that will connect Miami and Orlando. The QSK95 joins Cummins industry-leading lineup of Tier 4-certified product for rail applications, including the QSB6.7 (140 hp to 300 hp/104-224 kW), the QSX15 (600 hp/447 kW), the QSK19-R (760 hp/567 kW) and the QSK60 (2310 hp and 2700 hp/1723 and 2013 kW).